Our Data Diagnostic allows you to know where to focus your data efforts and quickly. Stop treating data as a problem and instead, start treating data as an asset. What is the Data Diagnostic? Drawing upon a combined 40 years of experience, Anmut’s Data Diagnostic tool permits the baselining, benchmarking and monitoring of your data management. Data strategies always have an as-is assessment component. While traditionally taking several months, the Anmut Data Diagnostic transforms this to a near-instant assessment of your organisation’s data maturity and the impact it is having on your business, via a system of targeted online surveys. Why is data maturity important? 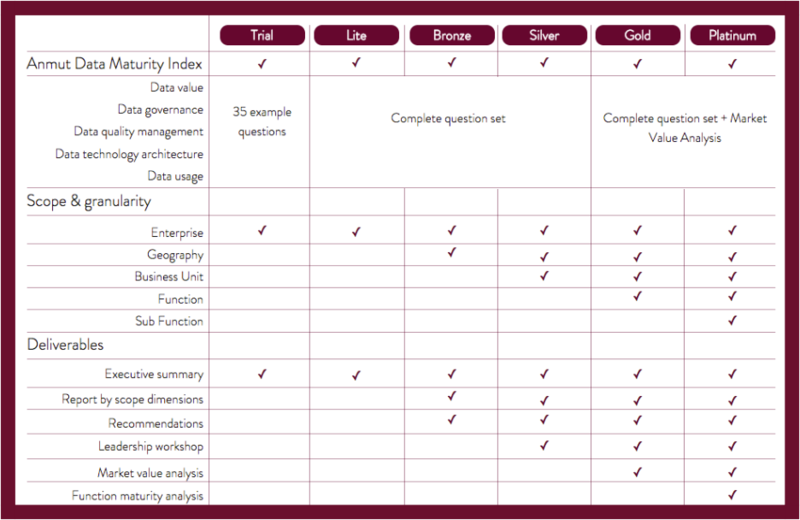 Data maturity measures how close your organisation is to realising the potential value of your data. Data mature organisations are rewarded by shareholders and other stakeholders alike because it creates sustainable competitive advantage. If it takes longer than a week to find the data you need for a key decision, you will be at a systemic disadvantage. Some organisations take months to find data and as such, are losing their market space to data savvy organisations. Read more on data maturity here. Assess whether your organisation treats data as an asset, and how effectively its value is communicated across the business. Read more on valuation here. Assess whether your organisational model, and standards, policies, and procedures support your data strategy. Assess whether the data architecture supports the strategic ambitions of the business, this includes an assessment of the structure, tools and competencies. Read more on strategic data architecture here. Assess whether appropriate data quality standards and tools are in place to support the provision of insights in a timely basis. Read more on data quality management here. Assess the state of your technology infrastructure to put the right data in the right place at the right time and also keep it secure. Assess your ability to produce high-value analytics, and its influence on decision makers and key stakeholders. How does the Anmut Data Diagnostic work? Anmut’s Data Diagnostic is based on a unique system of targeted online surveys. With a total of 250 questions, the diagnostic targets the root cause of issues across your data ecosystem. We tailor the grouping of questions so that a typical respondent answers a small number of questions, that combined, provides the full picture. Like a photograph, we aim to build a clear picture of your data maturity. And as with any photo, this is dependent on resolution. Our diagnostic is variable in scope such that a more or less detailed picture can be built dependent on your organisation’s requirements. At the highest-level, we provide a snapshot of your data performance at the enterprise level. Conversely, our most detailed analysis, our platinum-level diagnostic, assesses data performance at 5 levels; Enterprise, Geography, Business Unit, Function and Sub Function. This allows you to understand the variation in data performance at multiple levels, comparing data performance across your industry and within your organisation. Our platinum tool also includes our unique market data valuation, find out more about this technology here.